Really finding a t-shirt with a cool graphic is half of your t-shirt surgery, this is an original screenprinted t-shirt that I snatched up from Sonya Mouthshut. 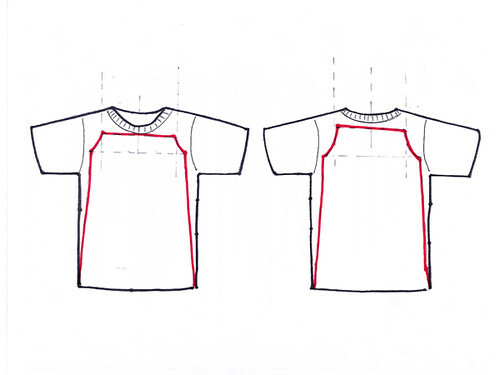 You pretty much mark out the armholes and sides the same as for the simple A-line dress, except that instead of cutting out the neckhole and shoulders, you just cut straight across. I cut a contrasting 1" string for another t-shirt. It has to be long enough to go over both shoulders and across the back and front, which you fold over and sew to make a narrow pocket. Thread the string through front and then the back pocket, and try on the shirt to adjust how long you want your strings. Sew the ends of the string together and pull the sewed part inside one of the pockets.